But the thing about Gen is that there’s always a lot more going on than either the first-time reader or any of the other characters suppose. He is truly an unreliable narrator – an infuriating, intelligent, highly-strung, secretive, multi-layered individual whom you get to like very much indeed. And the book, with its sequels, is set in an almost but-not-quite familiar early Mediterranean world, where gods are worshipped who resemble the Greek pantheon but are not – and where small city states war against one another, or form alliances, under the shadow of a powerful Eastern empire. ... so it's a special place for me. My husband was awarded a fellowship by the John Simon Guggenheim Foundation and we moved to San Diego for a year so that he could write a book. While he was working on his book, I wrote my collection of short stories, 'Instead of Three Wishes'. 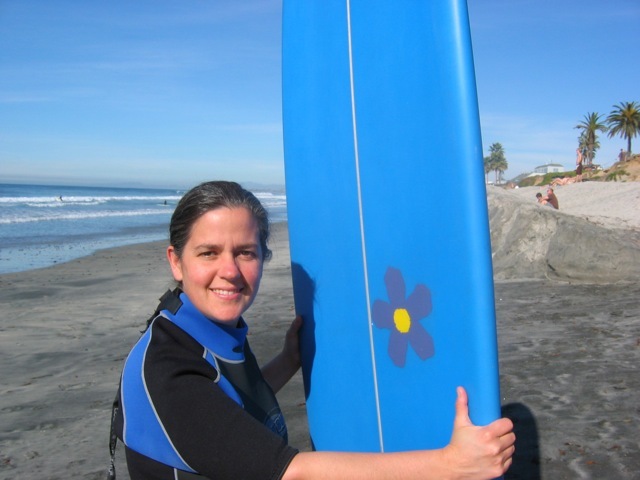 We moved home to Maryland for a year and then came back to San Diego the next summer. We stayed in the same apartment building, right across from the beach, and I drafted 'The Thief'. At the end of the summer we moved to Northern California for a year, and then back to Maryland. 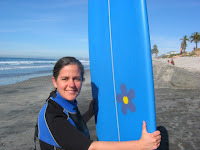 We didn't come back to San Diego except for short visits for almost seventeen years, but last year, my husband had a year of sabbatical time accumulated and we knew where we wanted to spend it. As we drove across the country I was contemplating the edits from my editor on 'A Conspiracy of Kings'. When we arrived in San Diego again, I sat down and finished the book and sent it off. It came out in April, time for us to have a book launching party before we got back in the car and drove home. …in the space of a few heartbeats, the river disappeared. The flow of its water stopped, came again in slushy bursts over the falls, and then stopped again. ... In the bulging rock where the waterfall had been, there was a recessed doorway. The lintel of the doorway was the rock itself, but set into it were two granite pillars. Between the pillars was a door pierced by narrow slits that were wider in their middles and narrower at the ends. The river water still sprayed through these slits and dropped into the round pool that remained in the basin below. The Thief was followed by its sequels, ‘The Queen of Attolia’, ‘The King of Attolia’, and ‘A Conspiracy of Kings’ and from an impressive start the books just get better and better. One of the many things I admire about them is their sheer intelligence. Lots of devious politics. Lots of twists. Characters do bad things – even cruel things – and yet we find ourselves in a process of learning more and more until we are forced to question our earlier judgements and see the characters differently. Interesting also is the way Megan Whalen Turner moves us away from her hero Eugenides book by book, even while he is still the focus of each. In ‘The Thief’, he is the first person narrator. ‘The Queen of Attolia’ is told in the third person: although Eugenides is still the main character, we see him often through the eyes of others – his close friends, family and enemies. In ‘The King of Attolia’, the point of view is that of the hopelessly straightforward young soldier Costas, completely and comically out of his depth as Eugenides’ unwilling bodyguard. And in ‘A Conspiracy of Kings’, we are back to the intimacy of first person narration – but by an entirely different character. I understand there’s another sequel on the way, and I cannot wait to read it. This book sat on my shelf untouched for years. Too disturbing to read, too compelling to overlook, it was a gift and absolutely could not be sent off to the library book sale. No matter how many times I weeded my collection, it always remained. There on the shelf, with its dark mesmerizing illustrations in black and purple and virulent green. 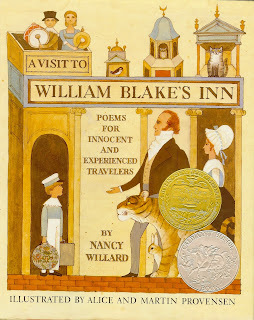 Those of you familiar with the deeply charming Animals of Maple Hill Farm, or with A Visit to William Blake's Inn which won both the Newbery Award and a Caldecott Honor in 1982 might be surprised that anything by the Provensens could be that disturbing. Yes, well they were always about more than cats and bunnies and talking sunflowers. In The Animals of Maple Hill Farm the Provensens introduce you to all the hens and roosters at their farm in a two page spread that includes examples of the obnoxious rooster, Big Shot, being nasty to the other roosters and bullying the hens, and then Big Shot gets carried off by a fox. And no one minds, they say with a shrug. 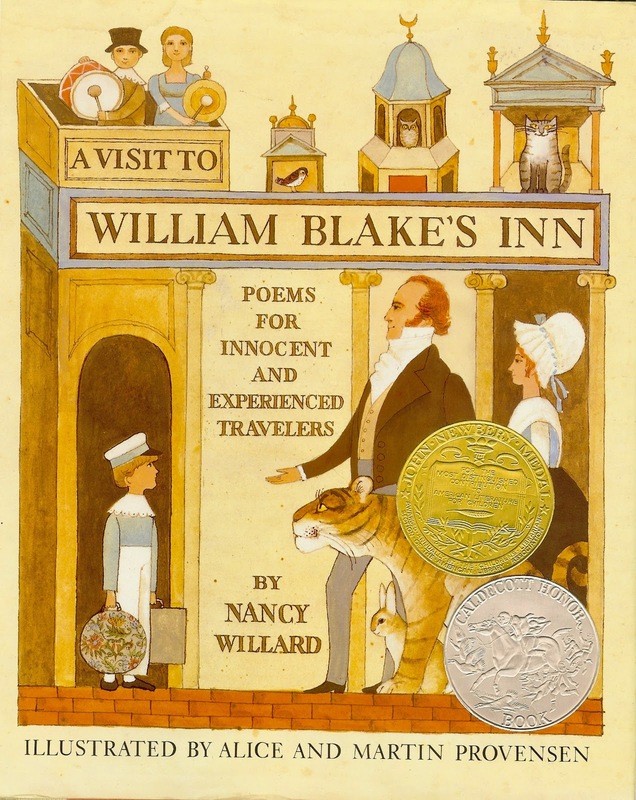 Look through A Visit to William Blake’s Inn and notice the semi-circular smile on the Man in the Marmalade Hat. That's him on the left. Observe his chiclet style teeth. Imagine an entire book peopled with those smiles and those teeth, and no friendly anthropomorphic sunflowers, either. The best you get is some malevolent looking mice. 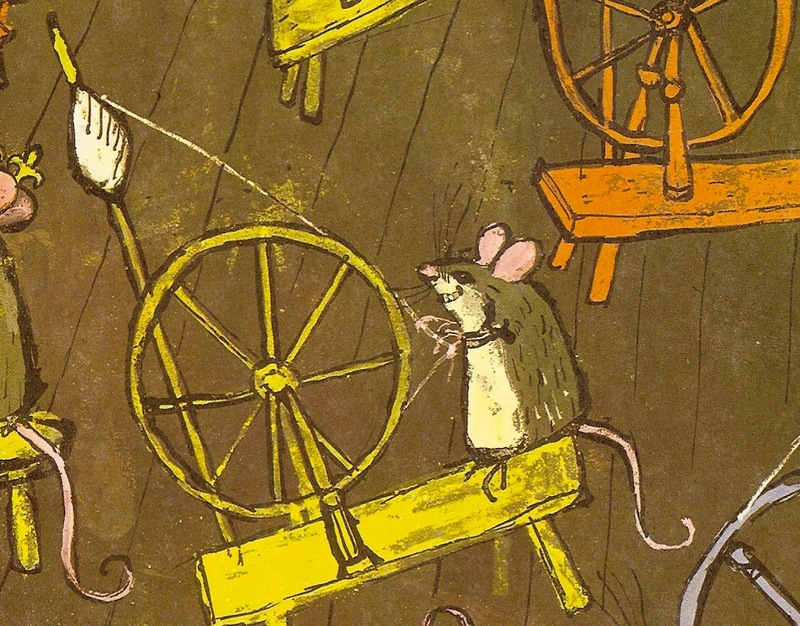 A mouse from "The Forest Bride" by Parker Filmore. 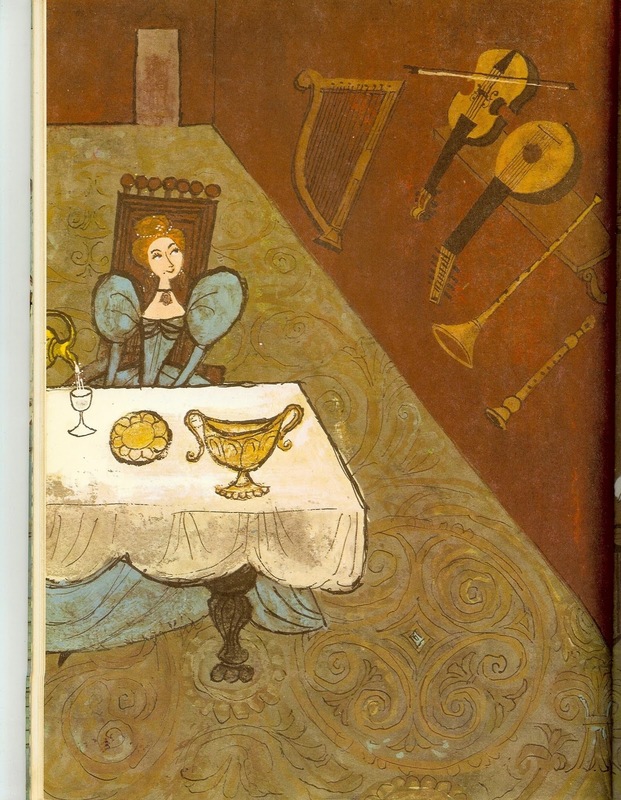 I couldn’t fit this into one scan, but if you look carefully you can piece together the composition with Beauty sitting at the table and the Beast lurking just around the corner. 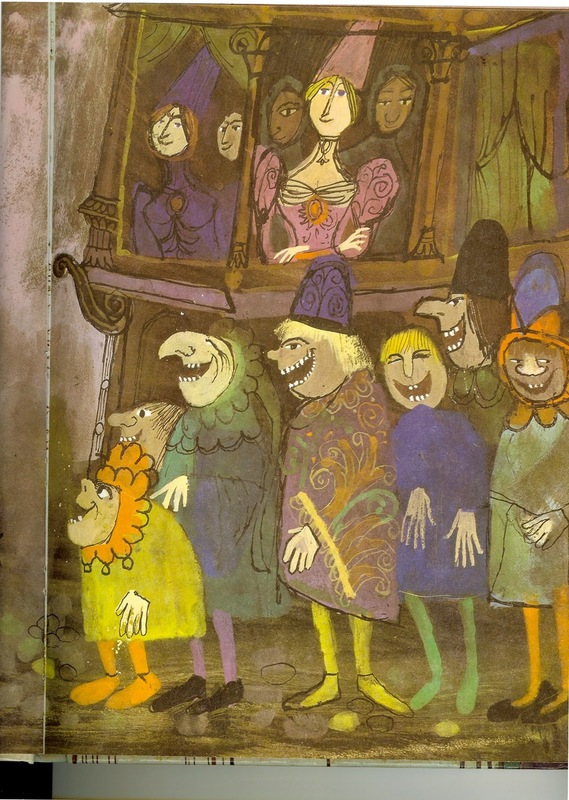 The Provensens have used the gutter between the pages to emphasize the corner in the image. The images aren’t merely frightening, they are brilliant and frightening. The hands of the beast are huge and clawed, yet they hang awkwardly, giving you the idea that in an unfortunate fumbling manner they might accidentally rip your arm off. This is from the happy, upbeat (not), The Prince and the Goose Girl by Elinor Mordaunt. Holy Cow. This book gave me the heebie-jeebies. So, of course, I left it on the shelf when I grew up and moved out on my own. And I never read it when I visited home. No, never. And when I saw a copy at a thrift store, of course I said, “Oh, look!” And bought it instantly. Okay, so there . . . there may be a contradiction there. And when I said the book sat on my shelf untouched? I lied. When I got the book home and looked through it, I remembered every single story. "The Lost Half Hour" where poor unfortunate Bobo is sent out by the Princess to find the half hour lost while she overslept. “Feather O’ My Wing” by Seamus McManus with the same spiteful stepsisters as “Beauty and the Beast,” but a story line a little more like “East of the Sun, West of the Moon.” Barbara Leonie Picard’s "Three Wishes" were the peasant boy gives away his hard earned wishes and receives them all back again. And perhaps my favorite, “The Prince and the Goose Girl.” The heroine Erith is absolutely indomitable. She won’t back down, not even if it costs her life, and when the Prince realizes this he also realized that Erith is right that he isn’t much of Prince. Fortunately, he becomes a reformed man, and because Erith is as kind as she is brave, it all works out in the end. Why, oh, why didn’t I think of "The Prince and the Goose Girl" when Katherine asked me to write a post? I think the answer has something to do with the Introduction to the book, which may be the one part I really didn’t read. 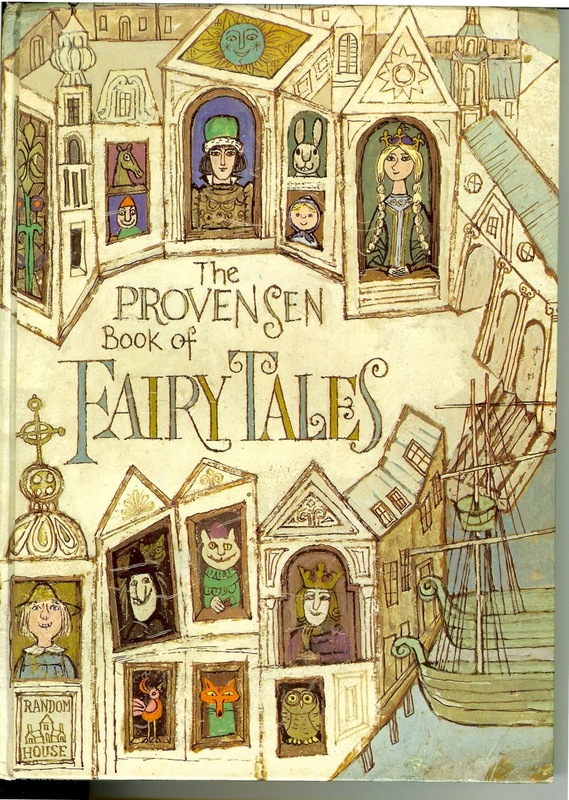 In the introduction Joan Bodger explains that these are literary fairy tales. The italics are hers, not mine and their elitism makes me uncomfortable, but I think Bodger is saying the same thing that I am struggling with. I didn’t like fairy tales when I was growing up because most of the things that were labeled “Fairy Tales” in my experience were those bowdlerized, dessicated versions that were three paragraphs long and came in books of a hundred or more and had absolutely no personality. Everything that gave them depth had been sifted out because it was rude, or it was frightening, or it made the story too long for its intended audience. They were stripped down to their Propp’s morphology. I tend to think of them as skeletons of stories, but the Provensons remind me that they aren’t dead skeletons so much as a seed bank that any of us can draw on, and that when we do draw on this seed bank, what we are writing (with or without the upscale qualifier literary) is fairy tales. It's fascinating how illustrations like these can draw you, yet repel you. Maybe we like to be frightened, a little bit, by fairy tales. 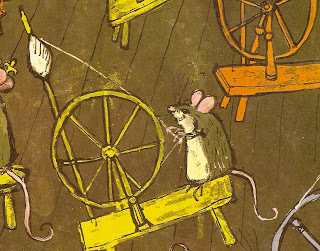 I can recall certain illustrated pages in childhood books that had to be turned super-quickly. Megan, thank you for sharing all these lovely illustrations! I have read "The Thief" and "Queen of Attolia" - both very enjoyable, so I must get hold of your other titles. We once shared space in a little black sampler produced by HarperCollins (with a chapter of The Thief and a chapter of The Great Pyramid Robbery, among others), so it's great to share Fairytale posts on Kath's blog, ten years later! One forgets how dry fairytales can seem when gutted, descaled and filleted. And how very scary pictures can be to a child. I am sure if I had come across this book as a child, it would have freaked me out just like Megan. 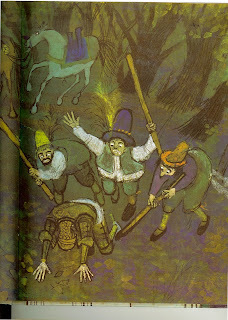 There was a picture of a goblin leaping out at Noddy, once, which frightened me so much my mother had to hide the book... pictures provide a sort of emotional weather which can uplift, enchant,depress or alarm, and perhaps I ought to think of following up this series with a series about fairytale illustrators and the differences between them! I had a picture book with eyes that moved - and I was terrified by it. I kept hiding it and my mother kept taking it out and putting it back in a prominent place. It was a gift from her mother and I HAD to like it. I think Juliet's right, and mostly we do like to be a little frightened. I think it's fascinating that what frightens one of child will be totally ho-hum for another. Monsters? Fangs? Gruesome skeletons? Not a problem for me. The teeth on that mouse? Terrifying. I was just talking to someone at the NCTE conference in Orlando about scary books and the way little kids are sometimes so relieved when an adult takes the book away. Only, it was hard, once I was the grown-up, to know when I should interfere. I just hope I never exposed my kids to anything as frightening as a book with EYES THAT MOVED. I do know, though, that I tried to take away a picture collection of portraits that allowed you to swap 1/3 of the face with increasingly gruesome variations. I thought it was horrible. My kids loved it and demanded it back. Oh, well. Whoops, I should have signed. The above comment was mine. 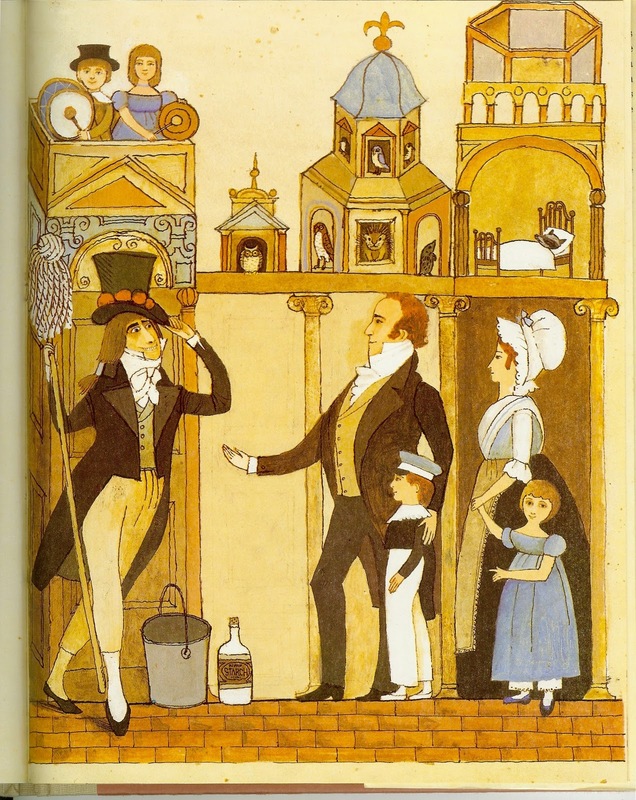 Oh that's interesting, I have a whole book of Henry Beston fairytales (which also has The Lost Halfhour in it) and I never knew that his stories were published elsewhere. 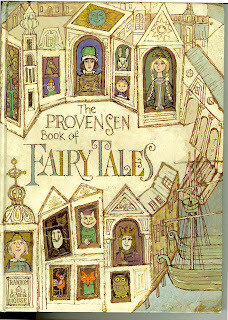 I loved the book as a kid actually but that might be because the illustrations in mine weren't nearly as creepy as those posted above. wanderingdreamer, it hadn't occurred to me until I read your comment that he might have more stories. I'll have to look him up, and the other authors as well. I love Barbara Leonie Picard's books. I think I'd love to read more of Beston and Filmore and Elinor Mordaunt as well. Wow. Happy Thought! Off I go to look up Seamus McManus! Oh! I love The Prince and the Goose Girl. It was in an anthology called The Faber Book of Modern Fairy Tales, and I must've read the whole book from cover to cover dozens of times. Right - I must find a copy! Okay, but I mean CRY and CRY and CRY. Fair warning! The book that makes ME cry and cry and cry is Astrid Lindgren's 'The Brothers Lionheart' - do you know it? No, I don't know that one. You read One is One and then tell me if I should read The Brother's Lionheart or if I should just figure I've read all the devastating books I need to in this lifetime. You'd love it. But I'll get one of my daughers to get 'One is One' for me for Christmas, and let you know! mwt; Are you talking about THREE AND ONE TO CARRY? Sherry, Not me. I haven't read any of the Willard books. Will they also make me cry?